Occasionally, when members of congregations which are only a couple of hours away stop by to deposit records, I'm able to give them the nickel tour of our archival collections. The peak of the tour comes when I open the door to the secure, climate-controlled, city-block-long area known as the Archives Annex, where our visitors are greeted by row upon row of compact shelving. Usually their first question is, "How much stuff is in there?" Then I talk about how there are basically two kinds of archives: the ones with their own scissor-lifts and the ones without. Really large archives, such as the ReCAP facility in Princeton, or the Ohio State University Archives, have buildings the size of airplane hangars, so records are stored a couple stories off the ground. Hence the scissor-lift. We're not that big, but we're one of the largest archives I've seen that doesn't yet need a scissor-lift to get stuff onto the shelf. In 1966, during planning for the construction of our current location, Theophilus Taylor of the Presbyterian Historical Society board insisted on the inclusion of underground space. In 1976, thanks to Taylor's foresight, PHS was able to link its basement with underground storage space beneath the newly built Old Pine Community Center. Stretching the whole length of the block between Fourth Street and Fifth Street along Lombard, equipped with fixed enameled-steel shelving, the space held about 20,000 cubic feet of records. In preparing for the transfer of records from PHS's Montreat, N.C. office in 2005 and 2006 we replaced the enameled-steel shelving with mobile compact shelving, allowing us to nearly double our capacity. 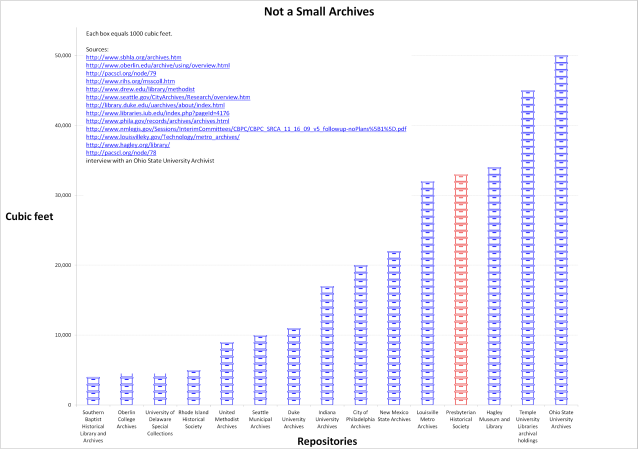 The chart above shows how we compare to some other repositories. With 33,000 cubic feet of archival collections, we're larger than most denominational archives, larger than the City of Philadelphia archives, and larger than my old alma mater's archives. And because Presbyterians are still writing records, we're constantly growing. Ask us how we can preserve your congregation's records for the next 160 years.